Memorial Church on the Stanford campus is probably the loveliest religious buildings I've seen in this country to date. I walked around the space with my eyes like saucers and my mouth agape on Thursday taking in the visual splendors. The mosaic frescoes seemed to have every color in nature in them. The stain glass windows glowed in the afternoon sun, making the depicted Biblical scenes look almost like they were animated. The great rotunda was perfectly balanced by the raked galleries to the left and right of the main altar. The place fairly vibrates with visual harmony. Sadly, I hear that the aural harmony of Memorial Church leaves much to be desired. I've heard from two separate sources over the past two days that the space is lousy to sing in from an acoustic perspective. "Everything sounds like mush," a chorister friend who has performed there on a number of occasions told me. It also sounds like the listening experience isn't optimal at the church, either. "The acoustics in Stanford's Memorial Church vary pretty dramatically depending on where you're sitting," another friend told me in an email upon reading my last post about my new life on campus for the coming academic year as a Knight Fellow. "You almost always want to be under the rotunda." I'll wait to hear a concert or two (and maybe, if I'm lucky, the experience of singing or playing there) before passing judgment. One criticism I am able to make about the church at this point, however, is the state of the floor. 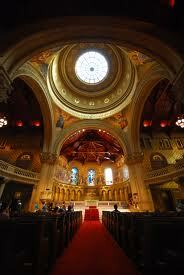 I find it strange that a church this physically stunning could have such a drab parquet. I know that churches are often designed with the idea that people should be looking up towards the heavens rather than down at their feet. But if you do happen to glance southwards, the ugly cork floor tiles come as a bit of a shock after the splendors of everything above them. I asked the student tour-guide who was leading the campus walking tour that I was on, why the university skimped on this aspect of the design. She panned the ground briefly as if noticing it for the first time. "I have no idea," she said.